How Hot Are Serrano Peppers? 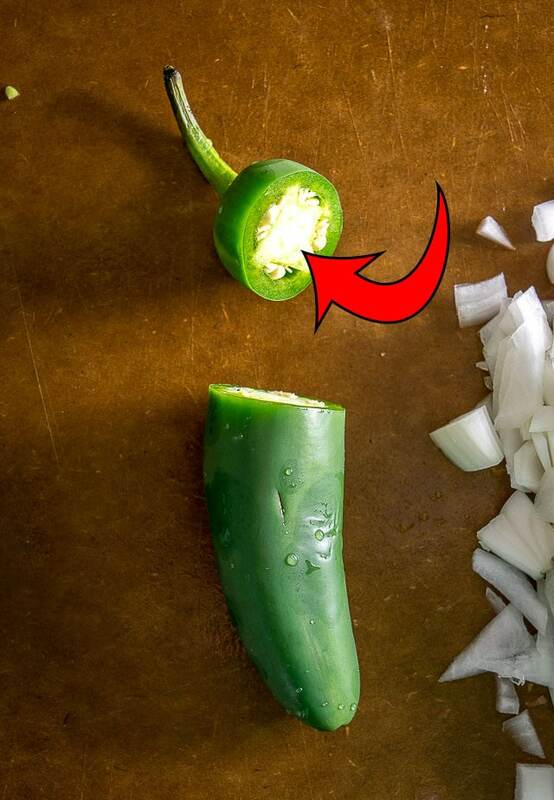 So exactly how hot are serrano peppers? And will they burn my house down?! 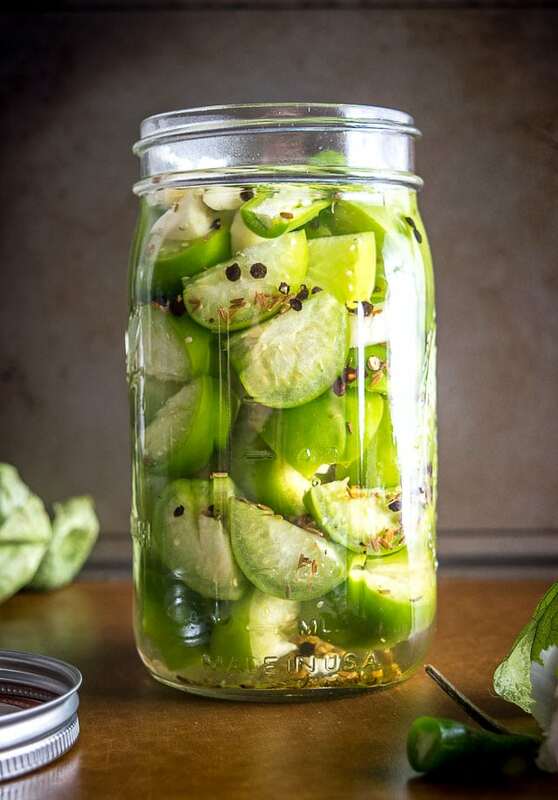 Serranos are more common in Mexico than they are in the States, but if you’ve got the option of buying them then go for it because they are a great addition to your home kitchen. 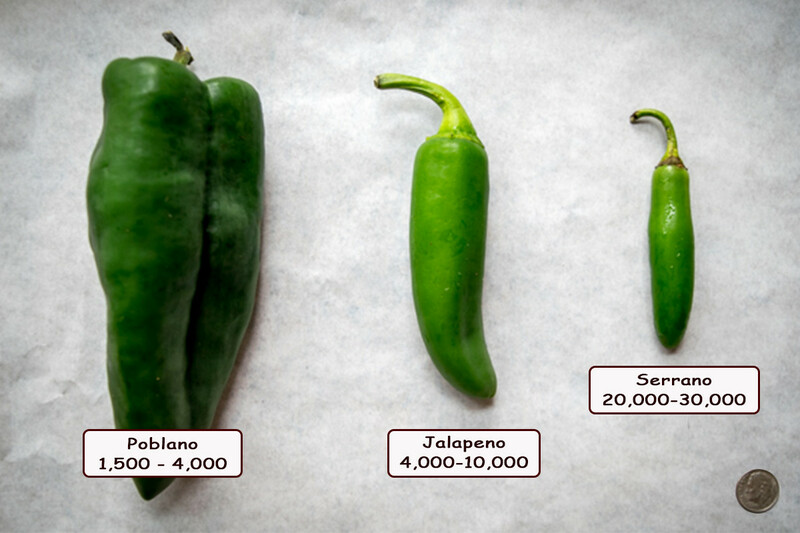 Here’s how they stack up next to poblanos and jalapenos. Serranos are usually skinnier than the jalapeno but they still pack quite a punch for their unassuming size. The above photo lists Scoville ranges — this is a convenient scale to measure how hot a particular chili pepper is. The higher the Scoville measurement, the hotter the pepper. If you’re familiar with jalapenos then you already have a good idea of how serranos taste. Most people won’t be able to tell the difference in flavor — serranos will be sharper and have a more grassy flavor. What Can I Substitute For Serranos? 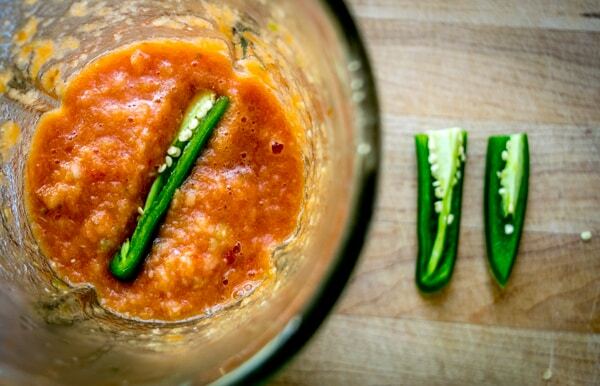 When you see a recipe call for serranos you can typically substitute jalapenos with no problem whatsoever. 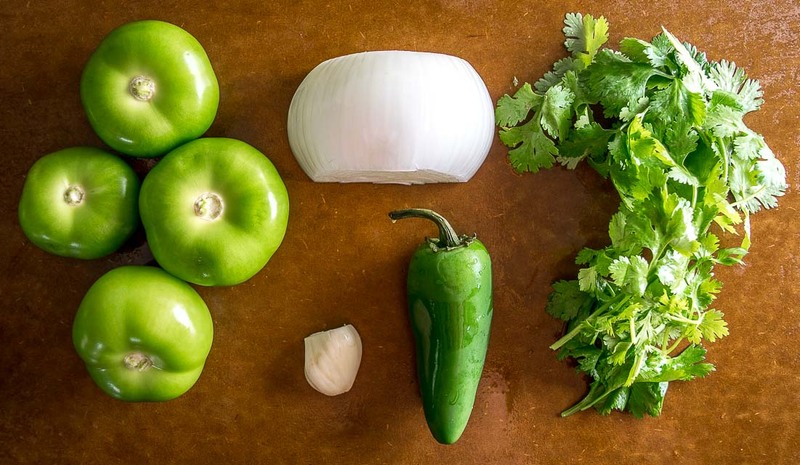 And since there is usually a visible difference in size between jalapenos and serranos, you can typically use the same amount of jalapeno as serrano. 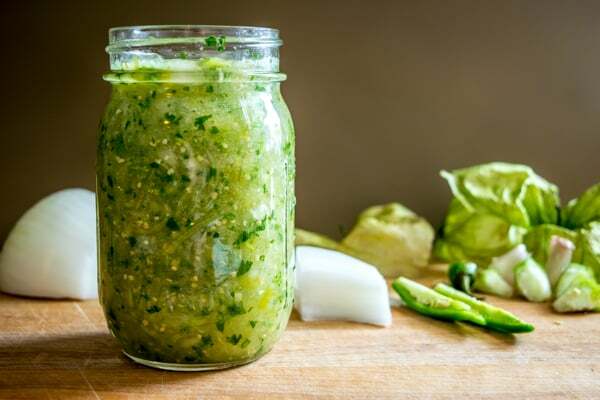 For example, if the Salsa Verde recipe recommends starting with half of a serrano pepper, simply start with half of a jalapeno pepper. 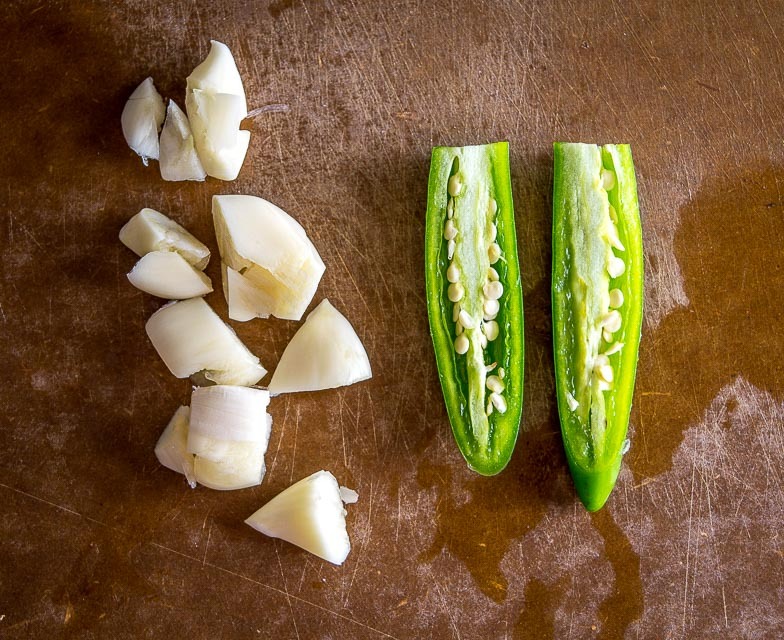 Even though the jalapeno will be milder, it will typically be larger so you’ll be adding close to the same amount of capsaicin. Of course, a lot of this depends on the actual size of the peppers so if you are concerned about a recipe being too spicy for your palate then I always recommend adding the heat incrementally and doing some taste testing along the way. It’s best to give the serrano a good rinse before using it. 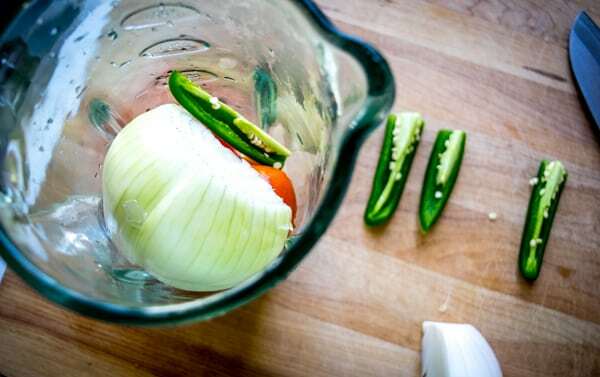 And you’ll want to cut off the stem of the serrano and discard it before adding it to the blender. By the way, take a quick look at this chili pepper cross-section. Capsaicin is the active component in chili peppers that gives them their distinct heat or spiciness. 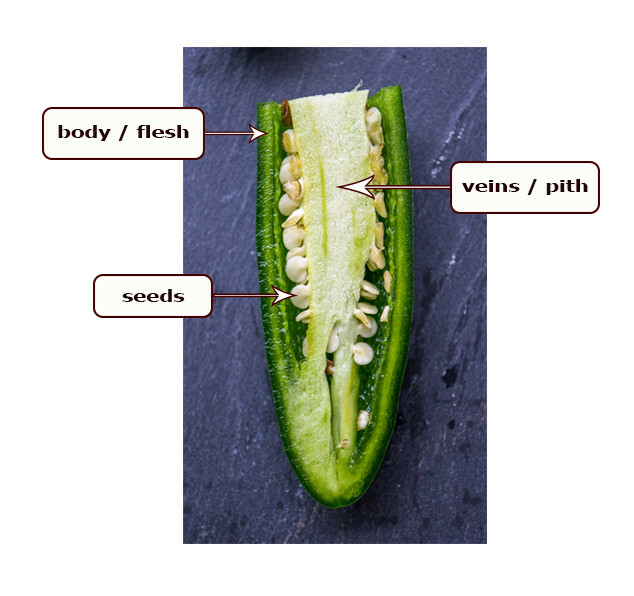 You’ll find the highest concentration of capsaicin in the seeds and veins of the chili pepper. That’s why you’ll frequently see people recommend to scrape out the seeds and pith when you want a milder version. That’s a decent option but I tend to recommend just using less pepper to start with if you want to dial down the heat. And don’t forget that the heat level of two identical looking chili peppers can vary quite a bit. Growing conditions can affect the heat of a pepper so it’s not uncommon for two identical looking peppers to have varying levels of spiciness. I’m in the habit of sticking my tongue in the middle of a jalepeno/serrano after cutting off the stem. I wouldn’t recommend this if you are sensitive to spicy foods, and I probably wouldn’t recommend it with the hotter chili peppers like habaneros, but with serranos and jalapenos it will give you a quick gauge of how hot the pepper is. Where Can I Buy Serranos? You’ll usually find serranos next to jalapenos in the produce section. You might have to make a couple stops to find them but it seems like the majority of supermarkets today are stocking them. I usually put them in a Ziploc bag and store them in the fridge where they’ll keep for weeks at a time. And serranos are so cheap that I’m in the habit of grabbing a few whenever I walk past them in the grocery store. Okay, let me know if you have any other questions about serrano peppers. 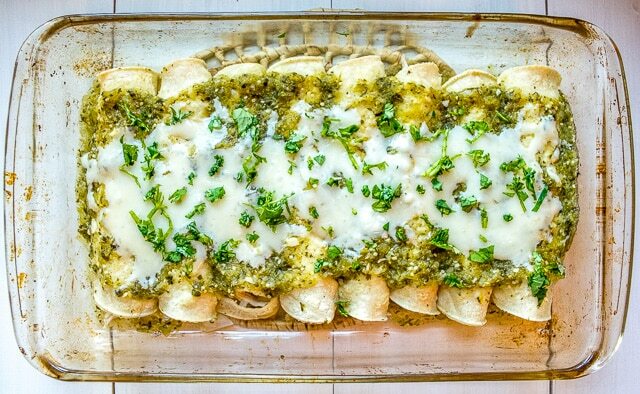 They are a great addition to your home kitchen and are a quick way to spice up your life! Want more ingredient and how-to articles? Click here.